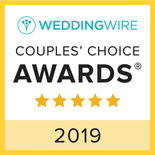 Award winning wedding Officiant with a beautiful ceremony including your preferences on vows, readings, rituals and more. Wedding license (that you bring to the ceremony) signed and mailed in the next business day. White Wood Lattice Wedding Arch (undecorated) or 2 post Bamboo Arch draped with white sheer fabric (or 4 post with upgrade of $100) or circle or heart shape of flowers (typically rose buds, sunflowers or gerbera daisies)​. Photography: Our award winning photographer will shoot for up to one and one-half hours. You will receive a link to a private online gallery within 6-8 weeks of your wedding to share with your guests/friends/family as you wish. On average, you will receive between 120-180 images from your event (usually more). You will receive all images in high resolution, fully adjusted and edited/retouched via digital download within 6-8 weeks of wedding. For more information regarding Heidi’s style (our main photographer for most weddings), please go to the photography section. Learn more about our award winning photographer on Wedding Wire and Yelp or on her site at www.HeidiBorgiaPhotography.com. Ceremonial Assistant for assistance during the ceremony. The ceremonial assistant will be present 15 minutes prior to the start of the ceremony through the end of the ceremony. If you wish, the assistant can be hired for additional time. Our officiant is there in advance for all of your other needs. One face-to-face consultation and unlimited emails and phone calls. Planning and coordination of your wedding celebration from the time the wedding starts till the photographs have finished. This package is for weddings with up to 50 people in attendance. 10, white wood wedding chairs (set with aisle). Chairs are required for all guests for weddings with more than 15 people. See our chairs section about adding more chairs. Popular add-ons to this package are an upgrade to a custom written ceremony (incorporating your love story), sound system with music (pre and post ceremony music as well as 3 songs of your choice for the processional / recessional), a wedding rehearsal (discounted rate), and a slide show movie set to music of your wedding celebration. You can also add a videography to help capture the moment!